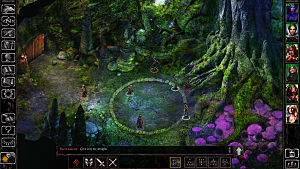 With the smash crowd funding success of retro resurgence titles like Pillars Of Eternity and Wasteland 2, it shouldn't come as much surprise that a developer would return directly to the sacred wellspring that is the Baldur's Gate series. Following enhanced editions of the main two games in the series, Beamdog / Overhaul Games now gives us a legitimately new Baldur's Gate entry. 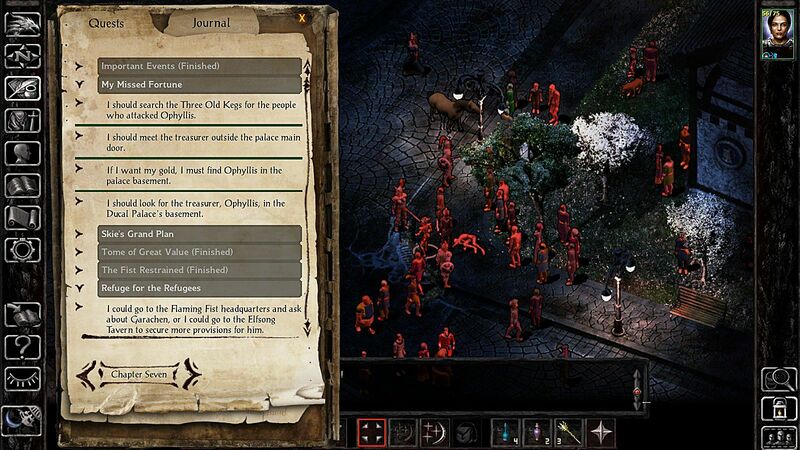 Somewhere between an expansion and a full game, Siege Of Dragonspear bridges the gap between parts 1 and 2, letting us finally know what occurred between Sarevok's defeat and the Bhaal-spawn's capture by Irenicus. How did they manage to make the sprites look WORSE than they did 17 years ago? How the hell am I even supposed to play like this? Or you can endlessly search for the perfect in-between zoom, which won't really lead to fully satisfying results on either the graphics or the gameplay side, but at least won't look completely horrendous. I'm not sure what prompted the change in the graphics and the ability to zoom rather than selecting a screen resolution, but it wasn't necessary. 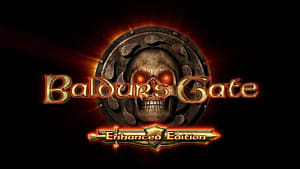 Although very dated, Baldur's Gate and its sequel have an iconic style that didn't really need a revamp, especially for people going out of their way to buy an expansion for a game of this age. Moving beyond that, let's dive into less unsatisfying aspects. Lots of familiar faces return and interact with one another in new ways, and in some cases even the original voice actors have been brought back on board. Get to ready to feel all kinds of nostalgic when you hear Minsc or Imoen's new lines. 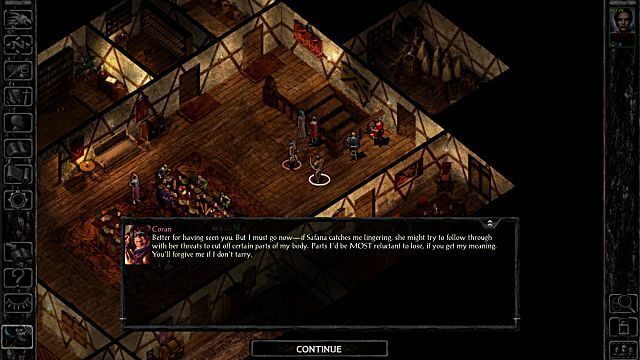 As an in-between title, Siege Of Dragonspear offers some missing insight into what led to all the jarring changes in characters that occurred in Baldur's Gate 2, like watching Iomen's training as a mage. Beamdog actually managed to weave the RPG mechanics into the story here, with Imoen sitting out parts of the adventure (since she doesn't have full access to thief or mage abilities until her two classes line up in level due to the old AD&D dual classing rules). Near the start of the story, your Bhaal-spawn hero also comes across someone who very much appears to be Irenicus and is very interested in your divine blood, laying the foundation for what is to come in the next game. You don't fool us, "hooded man!" It's a fun trip down memory lane (with the added bonus of being totally new content!) to see party members from previous iterations of the game interact with one another as you go around recruiting followers to join a new quest. Not all of them will join you however, and many of them have thoughts of their own on how to tackles issues, which they aren't timid about sharing. The thief Safana for instance isn't fond of traversing the jail in the Flaming Fist headquarters, while Minsc retains his devotion to only travelling with Dynaheir. 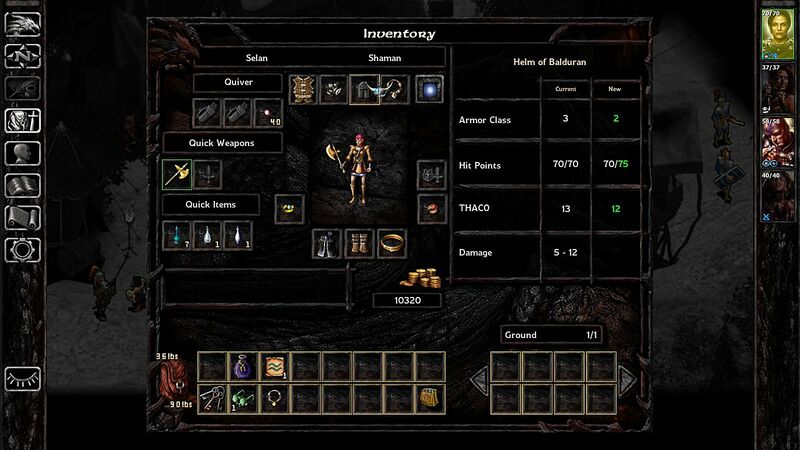 Plenty of changes to the Baldur's Gate UI you know and love have been added in with both the earlier enhanced edition and now with Siege Of Dragonspear. Some of the updates are welcome: “current” and “new” columns make the archaic 2nd edition AD&D rules more clear for how equipment and spells will affect your armor class, for instance, and it is now much more obvious which magical protection effects stack and which don't. That really should have been there from the beginning, Black Isle! Another nice update is that a yellow highlight lets you know which characters can use an item or weapon you've selected. You now also have the ability to scribe notes you find, so you don't have to leave them in your inventory, while the quest screen has neatly been cleaned up and is more intuitive. Other changes aren't going to go over as well for the purists who still replay the original regularly, however. 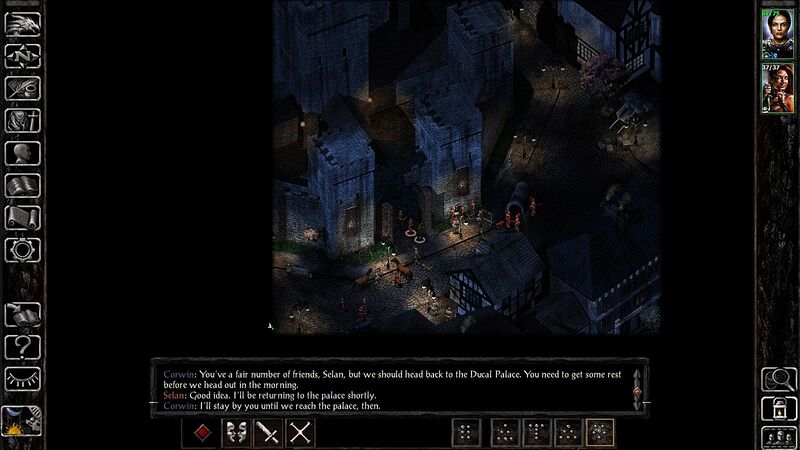 The health bars above everyone really ruins the Baldur's Gate feel (although they can thankfully be toggled off). Some obvious changes are also missing but feel like they should have been added in the updates to a new edition – like a radius to show you where an area effect spell like entangle or fireball will strike. It's interesting to see a new class get added, since the game still uses a long out-of-print ruleset. In addition to all the classes and kits from the previous BG games, you can now roll up a shaman, which is essentially the sorcerer equivalent of a druid. Where the class really diverges is in its main ability to summon spirit animal companions to fight for you every round, indefinitely – so long as you don't move or attack. It makes for a better back row class than front line fighter, but it does offer some very interesting tactical opportunities. 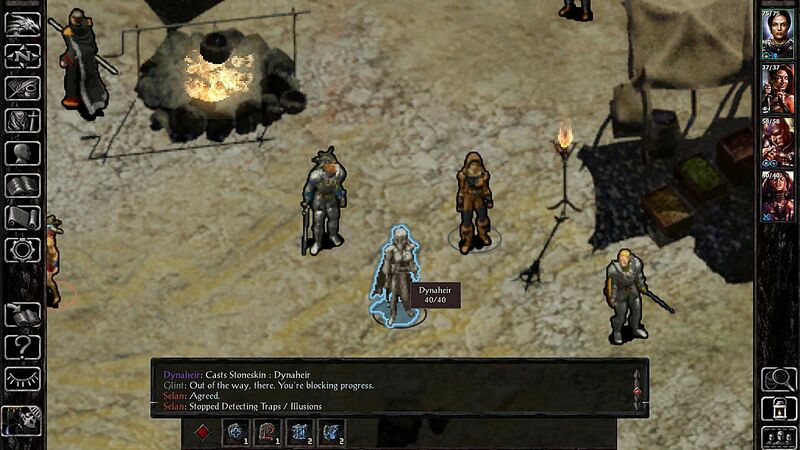 Unlike with Baldur's Gate 2, which only played at non-human party members by pretending Aerie was an avariel who just happened to not have wings, here we actually get goblin and gnoll companions in addition to the old familiar party members. 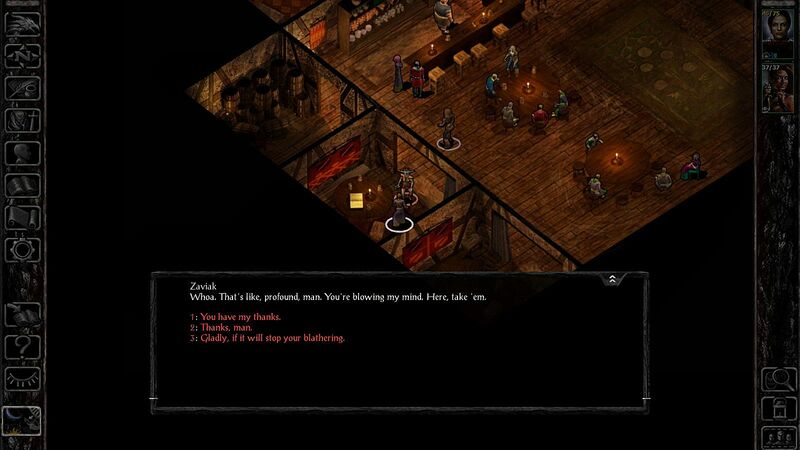 While I'm enjoying the new class and party member options, I'm much less enamored with the dialog in general, with a few exceptions. 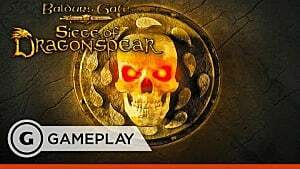 The writing overall isn't quite up to par with iconic Infinity Engine games (very much in keeping with Wizards Of The Coast video game style in the last decade or so, unfortunately). Of course, all three will typically lead to the same outcome, or if you take the third option, you'll just have to start the conversation over again to pick up the quest. You can't really join a plot to overthrow the dukes and take over the city for instance – you can only pretend to join and then alert the authorities. 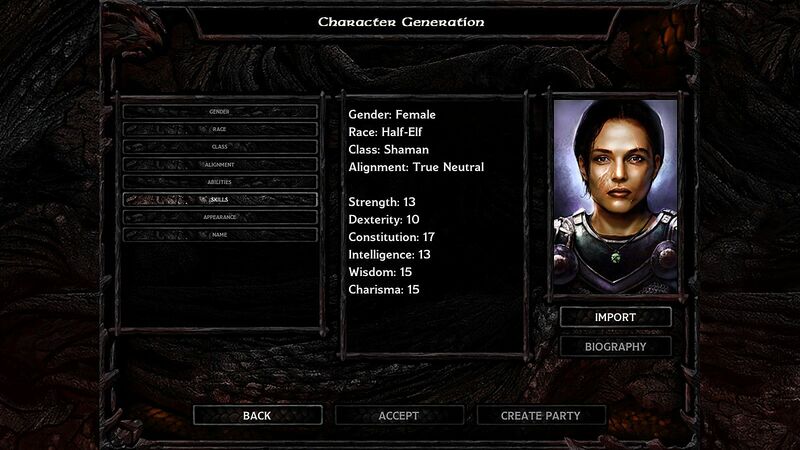 One instance of actual choice does pop up when you finally leave Baldur's Gate, however, forcing you to decide whether to tell the crowd you are a Bhaalspawn like Sarevok or to reassure them with comforting lies. It's unclear yet if this will have any impact on the game's story, but I'm glad the choice was there at least. A hero's departure or being run out by a booing mob? Choice is yours. 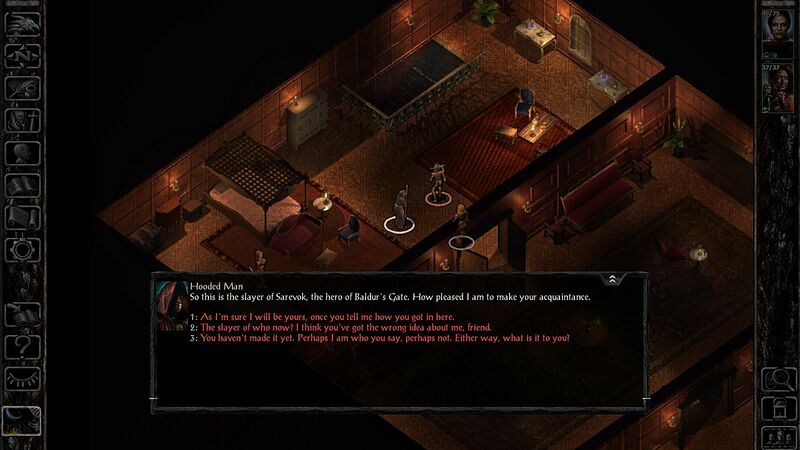 To be fair, some of the dialog made me smile and fondly remember playing the first game in my youth, and there were some interesting backstory elements added in, like meeting Corwin's daughter and grandfather. Several of the silly or tongue-in-cheek conversations had me realizing as an adult that I crave something more mature in my RPGs, though. To be blunt, Skie is pretty actively annoying. Several of the voice actors also go for over-the-top British or French accents, which really took me out of the setting (Faerun isn't Europe guys). The worst offender had to be Zoviak, who does a full-on Kenau Reeves “Woah” repeatedly, then talks like a totally tubular stoned surfer from the '90s. 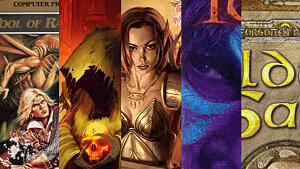 I get that they were trying for the classic Minsc comic relief, but for me it fell flat. 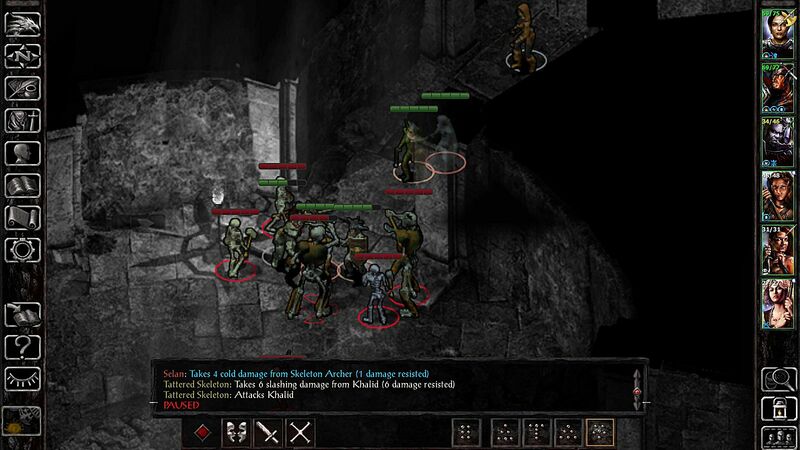 The expansion opens by having your hero and some old companions wrapping up the remains of Sarevok's followers by taking out his final wizard lieutenant in an old tomb. 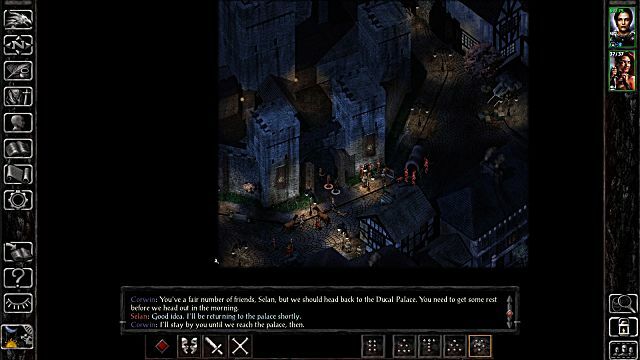 After that introductory dungeon delve all returns to normal for a time... until assassin's strike at you again, forcing you to move on in an echo of the storyline of the first Baldur's Gate. There will be time to explore various areas of the revamped city before joining the siege to stop the Shining Lady's crusade. 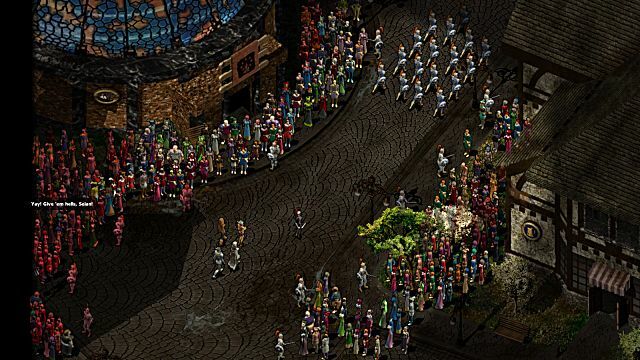 One way in which Beamdog improved on the formula is that Baldur's Gate itself now feels much more alive, with many more NPCs on the screen going about their business. The areas in general tend to be much smaller this time around, however. Before triumphantly leaving the city to stop yet another Realms-shaking child of a god, there's Fedex quests galore, which seems like an odd choice for this entry in the series. Everyone you meet asks “the hero of Baldur's Gate” to go on menial fetch quests: get my pouch from upstairs, go ask the Fist to send me more men, take this delivery to the moneylender, etc. 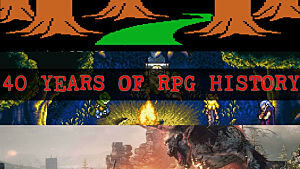 That by-the-numbers approach extends to the quest resolutions as well. 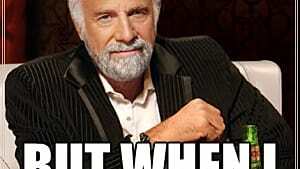 Expect lots of this scenario: “You did something super altruistic and went above and beyond? Here's this extra reward I had stashed that I didn't tell you about before. Man you are a real hero!” Thankfully, that does change a bit as you get further into the story. 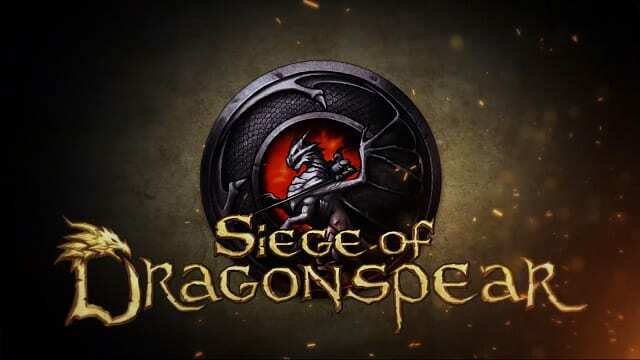 While there are disappointments (and I suppose there would have to be when dealing with more than a decade of waiting for a new game), this long-awaited expansion definitely has highlights as well, and it is growing on me the longer I play. 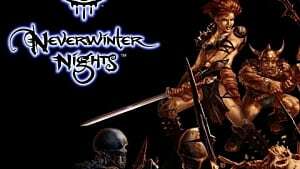 Unfortunately, it just doesn't manage to live up to the quality of the games that came before, and I can't see it ever really taking its place among the hallowed original Infinity Engine games. 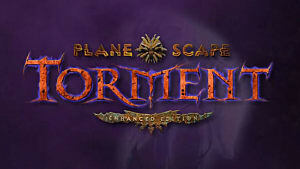 Gather your party and venture forth! Reviews for this are bombing all over. For good reason, too.